Aughhhh! I just wrote the entire post up for hours and for some reason, almost all of it deleted and autosaved with almost nothing. T_T Anyway, here's me rewriting everything. Hey everyone! Sorry I have been posting less frequently lately but it is because my 1 year anniversary is coming up on Sunday! I can't believe it has already been one year and I can't imagine having lived any other way. It has even been, dare I say, easy? It could be that we had dated for 7 years before we got married and got a lot of bumps out in the past but being around my best friend has been so rewarding emotionally, mentally, and spiritually. We are both really good about filling up each others' emotional bank accounts with hugs, laughter, and inside jokes and that helps to sustain us for when times get rough. As long as you are really ready, there is nothing better. 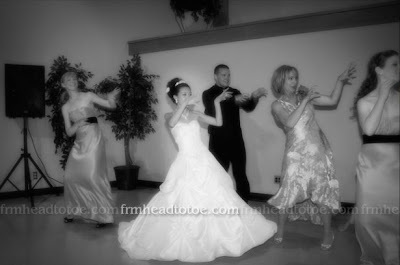 Now, on with the wedding photos. Size 4 Linea Paolo heels. Mmm, shiny and sparkly! The bouquet. 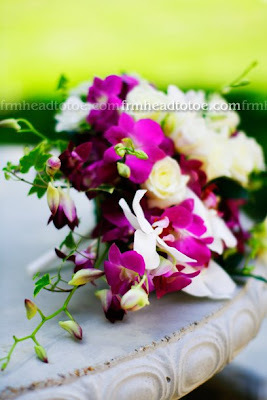 LOVE orchids, they were the theme of my wedding. 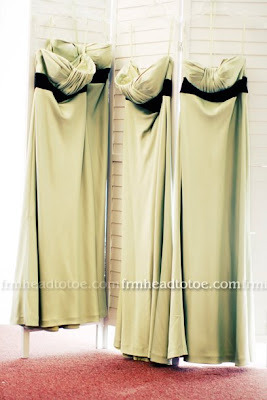 The bridesmaids' dresses. I loved the Grecian goddess bust and the black velvet waist. 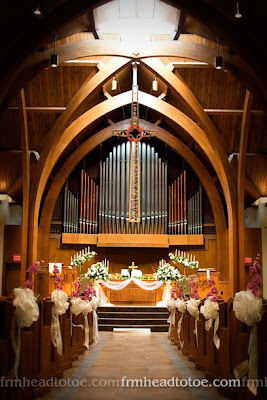 The gorgeous church. Orchids on the pews! This dress had SO many layers that needed to be puffed out! 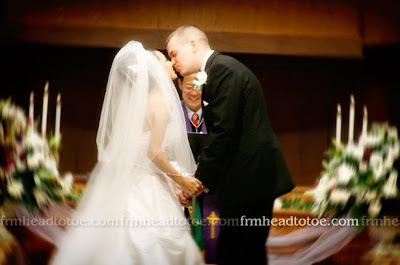 The kiss (or as my pastor called it, "You may now do the... Holy love action." It's all over, we're hitched! The after-party with a bit of my favorite, salsa dancing! Haha, sorry for so many photos but it was just too hard to choose! Thank you so much to Kassia for her wonderful photography to capture my wedding day. It still makes me feel all warm and fuzzy inside. 1. Stay away from glitter and shimmery makeup. You want the photos to show your face, not white reflective dots all over. This includes mineral makeup. 3. USE PRIMERS! Urban Decay Primer Potion is always great for eyelids, and a face primer is sure to keep your face matte and looking smooth with no touch ups for longer. 4. Consider using long-wear lip colors. I used Maybelline Superstay Gloss in 160 Glass Rose. 5. If you are bent on using lipstick, first apply liner on the entire lip and then the lipstick. Blot lips on a tissue, apply a second layer of lipstick, and dust loose powder over the lips through a tissue. This will set the lipstick and make it last. 6. I recommend using all matte eyeshadows. You can get away with something with a satin finish on the lid or crease, but at least get a good matte highlight color. I used NYX single eyeshadows in white and brown, and the Revlon Colorstay quad in Copper Spice. 7. Exfoliate your skin and lips the day before so you have a smooth canvas to work on. 8. Consider using false eyelashes. They really make eyes shine in photos! 10. Practice! 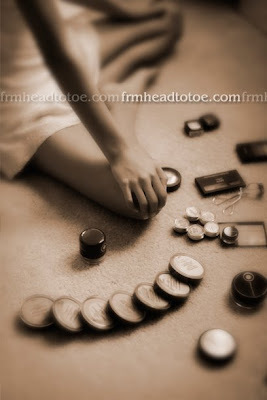 If you are doing your own makeup, you want a game plan before the big day. You'll want the least amount of surprises, trust me. If you are having a makeup artist, is really pays to have a trial run so you know what you are getting. There is nothing worse than feeling awful or self-conscious because you weren't prepared for an uncomfortable makeup artist job. Same goes for hair! 11. Go a little more dramatic than usual, but stick with a classic look that you will be comfortable with. Trendy is fun, but you want everything to stand the test of time. Just look at old 80's wedding pics! Ahhh, the hair and makeup!!! 12. Don't forget your nails. So many people will ask to see your ring and your hand will be photographed more than usual. A simple pale pink or french manicure is really clean and classy. 13. Hire an awesome photographer! 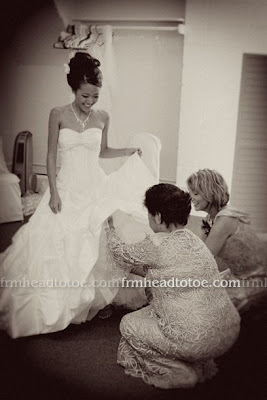 Your pretty makeup and dress will all be just memories without a great photographer to capture them. Do not skimp on this, and check out photographers' portfolios before you agree for them to shoot your wedding. 14. Get plenty of sleep and drink a lot of water. You will be going at full speed so it will REALLY be needed! Good luck and congratulations all of you who are getting married, have already been married, and want to get married some day. It's a truly beautiful thing and I hope you guys enjoy having read about mine as much as I had sharing it with you. thanks for the tips! hopefully i remember them by the time i get married, hahaha. your photos are absolutely beautiful! and you look so gorgeous in all of them! I love your tips on bridal makeup as I'm getting married next year! Did you do the makeup yourself? Can you do a tutorial with video for us one day.. 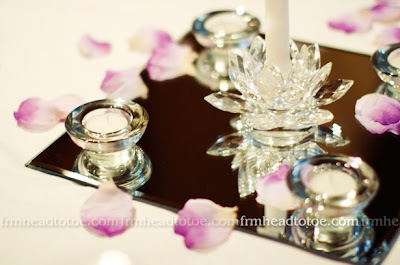 I need to learn how to do it as one of my weddings will be overseas and I'll be doing it myself! WOW that's all I can say! You looked absolutely stunning on your wedding day! Thanks for sharing us your 1 year anniversary pictures :] and happy anniversary for the both of you! You were simply gorgeous. 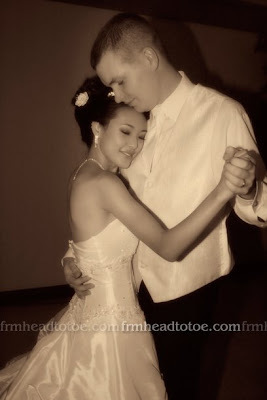 =)Beautiful wedding photos and you both make a very cute couple. wow you look gorgeous! and the pictures came out very nice! you look absolutely beautiful. :) congratulations on your 1 year anniversary! my bf and i have been dating for almost 5 years now.. i'm loving every minute of it! hope we are as happy as you guys are! i luv the pics! u look sooo pretty!! and thx for the awesome tips! Thanks for sharing your pics and your wonderful day with us. 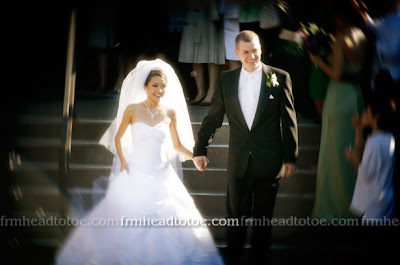 It looks like it was an amazing and memorable day - just like I imagine my wedding day to be one day when I meet mr Right! Congratulations on your anniversary - have a great day celebrating your union! Happy anniversary! you looked absolutely gorgeous! Just wondering, what kind of cartilage earrings do you wear? Izumi: It's always a good thing to tell your clients even if they aren't getting married. :) But you probably already have your list of do's and don'ts that you give them! Let me know if there is anything I missed! ♥akisa♥: I did do my makeup myself! I will definitely do a video on this as it seems to be a huge request. I just got a new camera that records in HD too so it will be super nice and clear! daisy: Ahhhhh, I looooved reading your comment! It's fine, I love essay comments. :) Yes, we have dated a ridiculously long time but with 2 very short, important breaks along the way. So strange about the word verification! I haven't heard of anyone else having that problem. Does this only happen on your computer or all computers? Thanks again! Yes, I have the same problem as another poster mentioned when I just go to frmheadtotoe.com and tried to put comments, I can't see the word verification part. It happens at computer at work and home. Your wedding photographer is great, too bad she's far away. Can't wait to see the wedding tutorial. Also, I was wondering what do you use to draw your eyebrows in. I saw all your posts but you never mentioned which eyebrow color and tools you use. Thanks. btw, maybe you can add a note somewhere for people having trouble with word verification, but i've noticed when i use firefox i can't see the word graphic if i just left click on the comments link but if i right click on the comments link & open it in another tab or window (or click both buttons at the same time to do that) then i can see the graphic and have no problems leaving comments. maybe that will work for other people as well? No wonder you said in your previous post how the photographer recommended you to do some part-time modeling.. because yous sure look like one! Omg Jen, you are so gorgeous and the wedding was too! Happy Anniversary! I know you are a makeup expert, but do you have any dating tips you'd like to share with us since you and your husband dated for so long? I've been together with my hubby (he's really just my boyfriend) for almost 3 years and people are already like OMG that is such a long time. We have had lots of arguments lately though, even though people think we are the perfect couple. How can we stay on track? Any tips? Aww! The two of you look so happy and joyous! Thanks for sharing your pics and tips! I know many of your readers will find them useful! And have a great trip celebrating your anniversary! 1) Did you ever get a lip piercing? 3) I noticed you have some cartilages,did they hurt? 4) Since you are savvy with conserving money, how do you buy fashionable clothes for reasonable prices? Such beautiful pictures Jen!!! seems like you have a lovely wedding. well congrats for the anniversary! gorgeous & flawless bride!! !...you guys look so happy & adorable!! !...Congrats on your 1st year hun! 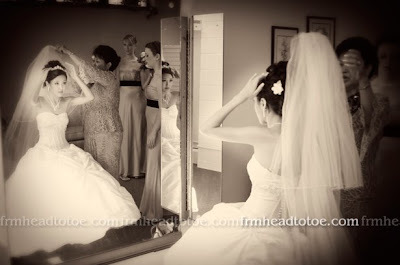 You looked incredibly gorgeous on your wedding day, your makeup skills are simply amazing. by the way - where did you get your purple extensions in your previous entry? i like the color! Oh my God, looks like a fairy tale, beautiful!!!! You are gorgeous and your updo woooooow!!! Hi! I'd been a silent reader of your blog since last year, I apologize for that but i'm leaving something now ^_^. Anyway, i just wanted to congratulate you and your husband for your 1 year anniversary! 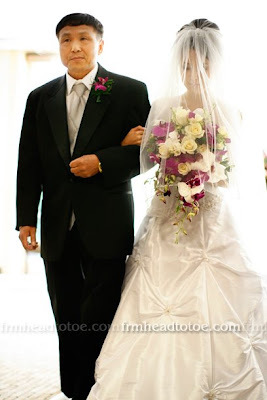 I'd always wanted to see your wedding pictures since you got married. Now that i did, i absolutely love them. You were such a lovely bride!! I love your dress, the makeup, the hair, everything. Seeing how your wedding was like makes me think about how my wedding will be like, but of course, i'm way far from that point right now haha. By the way, thanks for the great tips! 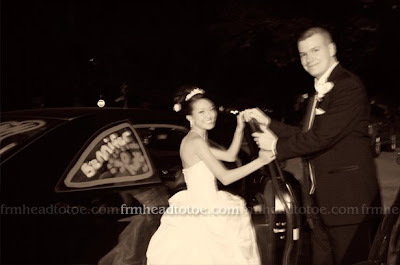 Thanks for sharing your wedding photos! The pictures were beautiful, you looked gorgeous, and the dress is amazing! Opps... I forgot to tell you, Congrats on your 1 year anniversary!! Also, commenting from above, when I go to leave a comment, I always have to refresh the page so I can see the image to type in for the word verifcation. You are so pretty! 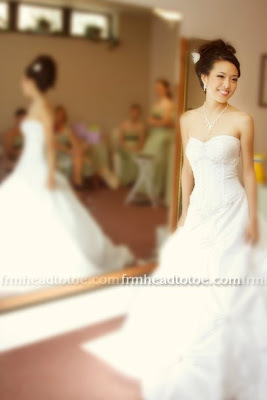 And your photos are gorgeous =) Can you do a tutorial on your wedding makeup? I remember you listed the products you've used in an older entry but I think it'll be super helpful to see how you applied everything. i've been following you ever since i saw your threads on soompi and i was sooo super surprised to see that you got MARRIED?!? you look wayy young. anyways, i loved everything about your big day. 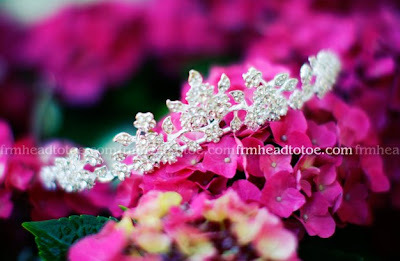 like your makeup, hair, dress, bridesmaid's dresses, center pieces were all amazing. congratulations! I love your blog:) Its very helpful and have to say you are one gorgeous gal! I am really interested in your make up for your wedding day as mine is in Jan next year and I am planning to do my own make up too! Can't wait for you video! Have a great day! Are you christian? You didn't have a traditional korean ceremony? :/ with the pink dots and everything.. I love your photos and you were one of the most beautiful brides I have ever seen!The dress is a dream!Congrats for your anniversary!Be always happy! Your makeup looks so good. I wish I can hire you for my wedding! Did you use Everyday Minerals as your foundation? Hi, I just saw your blog featured on DSK Jewelry. I love the bridal makeup tutorial. 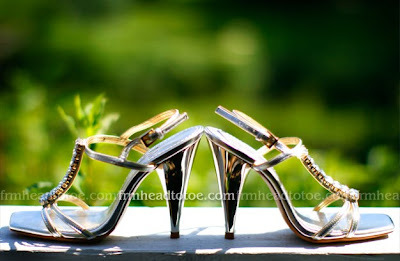 So I browsed through your blog and saw these amazing pictures of your wedding. You look so relaxed and happy in these pictures ( I was the complete opposite on my wedding day :[ ). I also like the fact that you don't only write about makeup which I think is a big PLUS. So beautiful! Who's the designer/brand for your dress? awwwww I just saw this post for the first time. 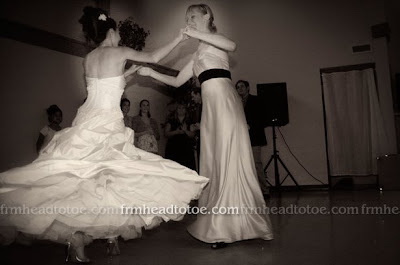 your wedding looked lovely : ) I am in such a happy mood after reading your post! You looked so pretty on your big day. Thank you for sharing your photographs with us. were you doing your own makeup for your own wedding?! Thx sooo much for the great tips. they are really helpful..
At the end i just want to Wish you all the best wishes for your rest of your life next to your husband. you were a beautiful bride! really enjoyed your photos! thanks for sharing! I think you are just absolutely gorgeous and especially on your wedding day! :) I feel so happy for you. 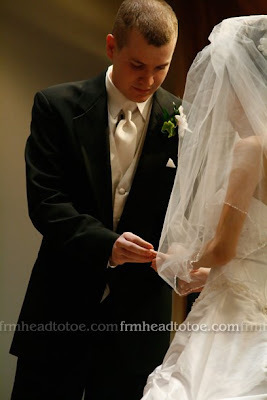 I do have a slight question for you because you didn't mention much about your hairdo on your wedding day. Did you do your hair yourself? or did you go to the hair/beauty salon to get it done? Because it honestly looks absolutely amazing! I keep staring at it, irresistibly! Please let me know. And if you did happen to do the hair, you should have a tutorial! :) I would love to see! Please and thank you! P.S. I love your blog! Did I mention that I have you on my blog as well?! It's on my VERY first post too! I'm a newcomer to your blog and love it! I'm Korean-American, also short and petite (4'11), and I just got engaged. My fiance is a lot taller than me.. 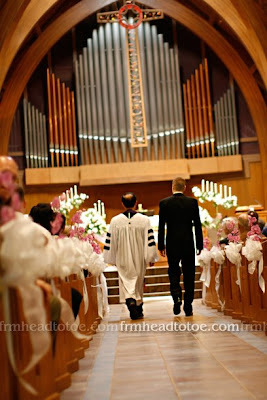 I was wondering how tall your heels were at your wedding. Do you have any brands to recommend, or tips on keeping feet comfortable? Such pretty photos! They are lovely! 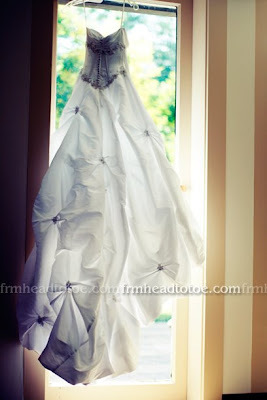 I really love your wedding dress, its pretty! 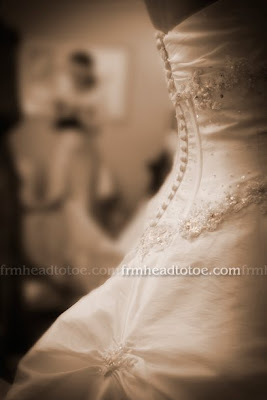 I will also marry next year on our 7th day of being together <3 I hope I will also be such a pretty bride as you were! You look so beautiful and happy. I hope that one day, I meet the right man, and have a wedding just as beautiful. Hey Jen, I don't know if you'll ever get the chance to read this out of all the people who leave you comments, but I just wanted to thank you for being such an inspiration both as a beauty guru, but also on a more personal level...I am also a Korean girl, and I am engaged to a non-Asian guy. As you know, this can be really tough within our Korean culture...and it really gives me hope to see someone else who has done it! Thanks again for touching lives more than you know! I thought I commented but guess not! I wanted to say you looked absolutely gorgeous (though I wish there were more up close shots!) I hope one day my wedding would be just as lovely! ohmygosh where did you get your gorgeous dress? Hey Jen, you're so gorgeous and you guys look so happy together :) now it's a lot longer than your 1st anniversary but congrats again! I'm going through some crazy stuff with my ex and it's really inspiring to see your love. Thanks for posting this! I'll take your tips and suggestions. 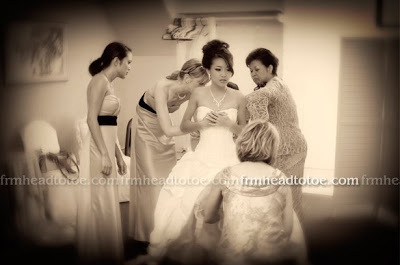 I hired a makeup artist on my wedding and I paid around 200 plus usd a package for 5 people. The ceremony was delayed as he was not able to finish my makeup on time. I could have atleast saved time and some bucks if I did my own makeup. Anyways, I'll surely do my own makeup when we renew our vows, hehehehe. I watch your video tutorials and I learn alot from you...you are a wonderful and beautiful guru . You have such a sweet love story...very inspirational. I love your dress, JEN! 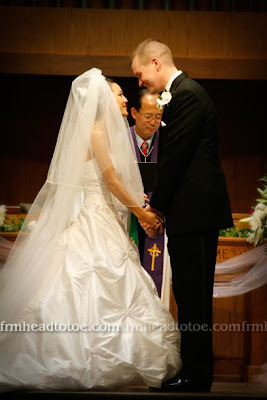 I'm sorry I was surprised, I thought you're husband was Korean! You're so gorgeous... stunningly beautiful! You're gourgeously beautiful! Married young is awesome! Wow you have a very stunningly wedding!